On 08 August 2015, Saturday at Subak Dine with Nature. Main Photo Caption: Group Photo (From Left): Daniel Looi, Operations Director of Watsons Malaysia; Low Siew Hui, Finance & IT Director of Watsons Malaysia; Wendy Loo, Public Relations Executive of Hospis Malaysia; Amar Asyraf; Nina Iskandar; Dato’ Fazley Yaakob, Famous Singer / Actor / Champion of MasterChef ; Danny Hoh, Head of Marketing of Watsons Malaysia and Jessica Ng, Digital and Consumer Experience Director of Watsons Malaysia. 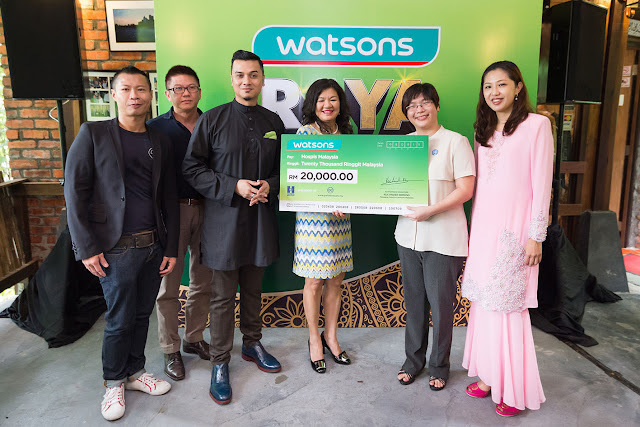 The Hari Raya Aidilfitri celebration became meaningful to 50 lucky Watsons Malaysia WeChat followers when they were exclusively invited for a Hari Raya Open House celebration with Raya Ni Dah Kahwin drama casts. The lucky winners were determined from a voting campaign during the 8-week airing of the drama were WeChat followers get to vote for their favorite drama cast member and stand the chance to be invited for this money can't buy experience opportunity. Photo Caption: A WeChat winner proving her acting skills in a drama sketch challenge with Nina Iskandar and Amar Asyraf. Leading cast members Nina Iskandar and Amar Asyraf were present at the Hari Raya Open House celebration and had a jolly good time with the lucky WeChat winners as they danced the joget to Rasa Sayang tune on stage. 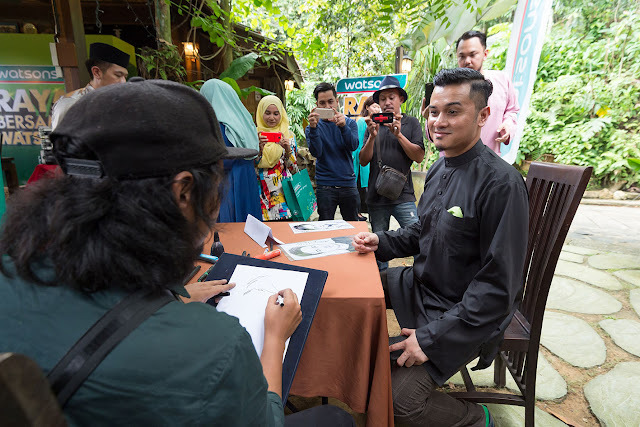 The actor and actress also took a challenge to the winners and members of the media who were present with a ketupat folding challenge, a short sketch challenge and a quiz trivia on the drama Raya Ni Dah Kahwin. Photo Caption: Lucky WeChat winners attempting the joget dance challenge with Nina Iskandar and Amar Asyraf. “We want to give a wholesome experience to Malaysians to connect in this joyful Hari Raya celebration with Watsons. And our aim is to showcase that Watsons is for the whole family through this drama series and the same time leverage a relationship with our customers,” said Danny Hoh, Head of Marketing, Watsons Malaysia. “This is an extremely fun and joyous celebration and I’m very happy to share this moment with Watsons Malaysia WeChat followers. I hope they had a great time like I did, especially with the joget,” said Amar at the celebration held at Subak Dine with Nature, Bukit Lanjan, Kuala Lumpur. Photo Caption: Dato’ Fazley Yaakob had a caricature taken of him during the Hari Raya Open House celebration. Photo Caption: Watsons Malaysia contributes RM20, 000 to Hospis Malaysia. Group Photo (From Left): Danny Hoh, Head of Marketing of Watsons Malaysia; Daniel Looi, Operations Director of Watsons Malaysia; Dato’Fazley Yaakob, famous singer, actor and Champion of MasterChef; Low Siew Hui, Finance & IT Director of Watsons Malaysia; Wendy Loo, Public Relations Executive of Hospis Malaysia and Jessica Ng, Digital and Consumer Experience Director of Watsons Malaysia. The celebration added another meaningful sentiment when Watsons Malaysia presented a mock cheque to Hospis Malaysia with RM20, 000. The amount collected was a collaboration effort between Watsons Malaysia and GlaxoSmithKline Malaysia held during the Ramadan month whereby every 10 cents is donated to Hospis Malaysia for every Panadol or Panaflex purchased at Watsons stores. Low Siew Hui, Finance and IT Director, Watsons Malaysia was present to hand over the contribution to Wendy Loo, Public Relations Executive, Hospis Malaysia. Also present to witness the handover was Jessica Ng, Digital & Consumer Experience Director, Watsons Malaysia, Daniel Looi, Operations Director, Watsons Malaysia, Danny Hoh, Head of Marketing, Watsons Malaysia and celebrity master chef winner Dato’ Fazley Yaakob. Raya Ni Dah Kahwin drama series was a sequel to Raya Ni Mesti Kahwin (2014) and was aired on TV3 during the Ramadan month. For Watsons Malaysia, it was an opportunity for Malaysians to foster relationship in this joyful Hari Raya celebration with Watsons. And the aim to showcase Watsons is indeed for the whole family proved successful as Raya Ni Dah Kahwin was watched by nearly 15 million viewers! Visit Watsons Facebook www.facebook.com/watsonsmalaysia or Watsons official website www.watsons.com.my. Don’t forget to ‘Like’ Watsons Facebook page and follow Watsons Malaysia official WeChat account!